Spray 5-quart oval slow cooker with cooking spray. In slow cooker, mix chicken, broth, carrots, celery, onion, thyme, salt and pepper. Cover; cook on High heat setting 3 to 4 hours or on Low heat setting 6 to 7 hours. Uncover; using 2 forks, shred chicken into large chunks. If using Low heat setting, increase to High. In small bowl, beat cornstarch and water with whisk until smooth. Add cornstarch mixture and cream to slow cooker; stir to combine. Cover and continue to cook on High heat setting 20 to 25 minutes or until slightly thickened. Meanwhile, in medium bowl, stir together Bisquick™ mix, milk and 2 tablespoons of the parsley until soft dough forms. Drop dumpling batter by heaping tablespoons onto simmering chicken mixture in slow cooker. Cover and cook 20 to 25 minutes or until knife inserted into dumplings comes out clean. Divide stew and dumplings into 6 serving bowls, and sprinkle with remaining parsley. Serve immediately. 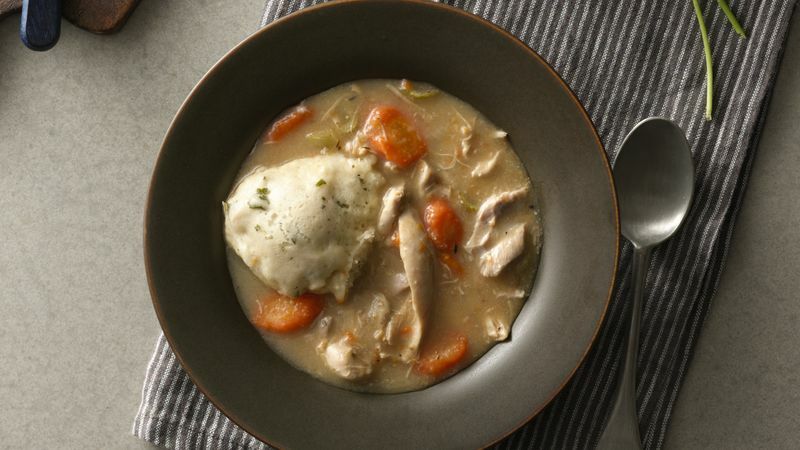 Don’t worry if the chicken stew looks thin before you top with the dumplings. It thickens as the dumplings cook. If you prefer to use fresh herbs in the stew, add 2 teaspoons chopped fresh thyme leaves in place of the dried thyme leaves.